In the early days of our palliative care team at the Hospital of the University of Pennsylvania, we cheered each time we received a consult order from a new referring service. We celebrated when our inpatient consult volume doubled over one year, and we were initially successful in adding staff. Over time, funding new positions became increasingly difficult. As our daily census surpassed 50 and then 60 patients, we realized we needed a new skillset. We were expert at explaining and demonstrating the value of palliative care, but we had no strategies for adapting and surviving in the face of excessive demand for our work. 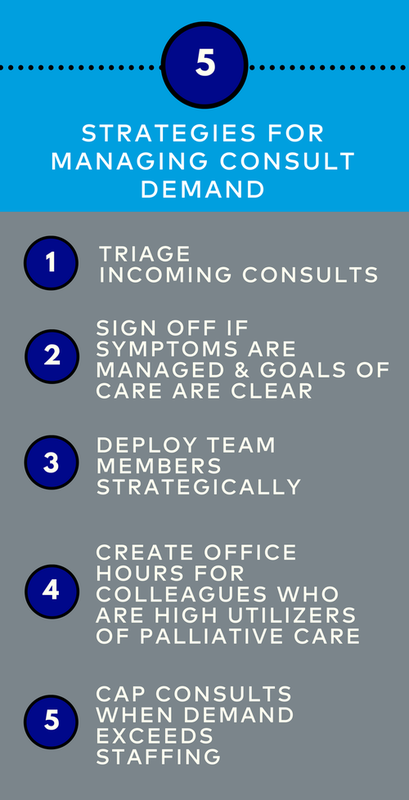 Over the next two years, we implemented multiple strategies for managing consult demand in excess of staffing. We are now able to look back and evaluate many of these strategies. Many new palliative care teams see every requested consult in order to build their referral base. With growth, teams may need to prioritize and redirect some requested consults. For example, our team recommends a hospice consult if a patient clearly does not want to pursue further disease treatment and is in the last six months of life. Unit social workers may be able to offer sufficient support for certain other patients. We also partner with the pain team to see our pain consults on especially busy days. Whereas palliative care aspires to provide a comprehensive interprofessional team for each patient, excessive demand may require a more efficient approach. Our team now assesses each patient’s needs and determines the exact team members needed. For example, a pain management consult may be handled by a pharmacist. A support consult may be handled by a social worker. Not all consults require a physician or advance practice provider. At the peak of our growth, one third of consults came from several oncology services. Further analysis revealed that many of these consults were for straightforward symptom management or assistance with community resources. We instituted “palliative care office hours” during which a palliative care provider is available to the oncology services to answer questions. This model reduced consult volume significantly while empowering primary teams to address basic palliative care needs. Our most dramatic strategy was implementation of a consult cap, or maximum number of consults per day. Some palliative care teams do this informally, but we opted to discuss this issue openly with leadership and issue a hospital-wide email announcement explaining the rationale and implementation of the cap. We continue to set a maximum number of new consults each day based on the number of providers working. Consults requested in excess of the cap are not seen; instead, providers are offered a phone “curbside” and then asked to call back the next day if a consult is still needed. About half of the teams call back the following day. We implemented these strategies in a stepwise process, starting with triage, and ultimately ending with the consult cap. The resulting improvement in palliative care team morale was striking. Clinicians regained a sense of control over their work day and an expectation of reasonable work-life balance. While none of these strategies would be needed in an ideal world of unlimited funding and abundant workforce, most palliative care teams operate in resource-constrained environments. Much has been written about strategies to grow demand for palliative care, but equal attention must now be given to managing demand with a limited workforce. Much has been written about strategies to grow demand for palliative care, but equal attention must now be given to managing demand with a limited workforce. 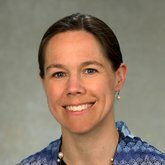 If your team struggles with seemingly unmanageable consult volumes or less-than-optimal interdisciplinary team performance, the Center to Advance Palliative Care’s Improving Team Effectiveness series can help. CAPC Members, sign up for one of our upcoming webinars or Virtual Office Hours to learn techniques for building and sustaining a stable, skilled, and effective IDT.